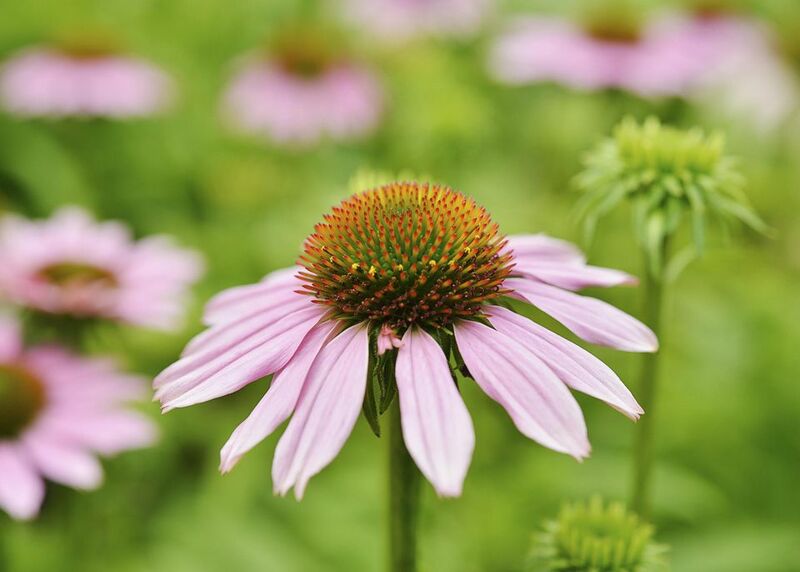 Growing purple coneflower (Echinacea purpurea) is simple because they are just so easy. They prefer full sun and well-drained soil but will grow just about anywhere. They don't need additional fertilizer, and, once established, will even grow well without additional irrigation. Deadheading faded flowers will encourage the development of more blooms, but it's a good idea to leave some of the old blooms later in the season as they provide food for birds as well as winter interest in your garden. There aren't many pests and diseases that plague purple coneflowers. One of the more common (and destructive) however, is aster yellows, which is spread by leafhoppers. The signs of aster yellows are deformed flowers with short, stunted petals, as well as a pale, sickly look to the blooms. Unfortunately, the only way to treat a coneflower with a case of aster yellows is to remove it from your garden. Not doing so will put your other plants (particularly coreopsis, other coneflowers, and asters) in danger of having aster yellows spread to them as well. Purple coneflower (the native version, not any of those fancy versions that are popular now, which are hybrids) are easy to grow from seed. In fact, many times if you don't deadhead in the fall, you'll find a few little volunteer coneflowers in your garden in the spring. You can dig and transplant these volunteers. You can grow them from seed indoors under lights or by winter sowing them (which is the easiest way to grow purple coneflowers from seed). If you don't want to start from seed, you can also propagate coneflowers from stem cuttings or by dividing existing plants.